The restoration of the Soulsby Station in Mount Olive IL is just one of the many preservation projects of the Route 66 Association of Illinois. The Soulsby Station Society, cofounded by our own Tom Teague, was instrumental in restoring this historic site. Here are his journal entries chronicling this process. Good evening, everyone: We got some good news from the feds today: we will not need to submit formal architectural drawings with our grant application. All we have to do is submit lots of pictures, including close-ups, of the parts of the station that we will be changing—ceilings, doors, the path that wiring might take, etc. Mike, can you take care of that in the next week or so? Ollie, would you please ask Mr. Campbell if he has any digital images of his products that we can use? Mike and Nelson, is there any chance of getting the new sign panels in before the April 30 deadline? That would make a great picture. Speaking of pictures, the same artist who did our original T-shirt picture is doing a new one. It will have a bit more of a front-on view and Russell will be standing by the pumps. Besides T-shirts, I hope to sell some fine art prints of the new painting. As with the other visuals, I hope this one will be done by deadline. We should think about getting involved in the big party in Litchfield on the last weekend in June. Maybe we could offer free shuttle tours to the station in classic cars. I’ll have a complimentary table in the artists tent (no irony intended). Ollie has submitted his bid and resume. They both look pretty good. Ollie and I are also meeting soon with the Dixie folks and Jeff LaFollette to discuss the future of the Hall of Fame. I think something real good will come from this. Back to Soulsby’s, though. I’m attaching and pasting my first draft of the narrative for the grant application. Everybody please take a close look and share your comments. We have plenty of time to get it in perfect shape. The Soulsby Station Society and its partners propose physical improvements to the station to preserve its structural integrity and prepare it for use as a roadside museum. 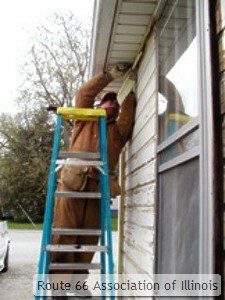 These improvements include floor repair, wall repair, roof repair, new wiring and outlets, the installation of a fire alarm and security system, and ceiling repair and insulation. The floor has four termite-damaged spots. We will replace them with flooring of similar vintage. But first we will remove all the flooring and repair or replace the floor joists. At the same time, we will deepen the crawlspace under the building to make future repairs easier. We will remove all wall covering, inspect for termite and other damage, and make necessary repairs. Tests indicate they will not be extensive. Then we will install new insulation. We expect to be able to use original materials when we cover the walls again. We will rebuild and recover two spots on the roof that have been damaged by wind. We will also rebuild the flat (central) portion of the roof and recover it. We will run a new electricity line into the building from underground. Then we will install new wiring and fixtures sufficient for operation as a museum. We will install new door locks, window locks and a fire alarm and security system for the building and its artifacts. Currently, there are no alarms and the doors open with skeleton keys. We will reinsulate the ceiling and replace damaged tiles. This project is the second phase of a restoration effort that began in 2003. In the first phase, we removed the station’s vinyl siding and repaired its original wood siding. Using a computer analysis by the Ace Hardware, we painted it the same colors that it had from 1937 to 1980. We also restored the doors and windows. Only the front door had to be replaced. With this project, Soulsby Station will be structurally sound, historically accurate, and accessible to the traveling public. The Soulsby Society and Soulsby owner Mike Dragovich intend to maintain the station as a roadside attraction and museum. It will feature original artifacts, historical Route 66 photographs, and Shell Oil memorabilia. Because we’ll have no paid staff, we expect to be open primarily by appointment or during special events. Therefore, we will strive to make the station as inviting and rewarding as possible to casual visitors and passers by. Already we have picnic tables under the pin oak that’s grown between the legs of the repair ramp. We’ll also arrange interior displays so they can be appreciated through a window. Michael Dragovich owns Soulsby Service Station. He has and will continue to contribute cash and in-kind labor to the project. He has signed a Property Maintenance and Protection form. He has agreed to work with the Soulsby Society to maintain the station as a roadside attraction and museum indefinitely. He also has an extensive collection of Shell memorabilia that is already on display at the station. Robert Campbell is a Soulsby relative and the owner of Mac’s Fire and Safety of Litchfield. He has offered to install a comprehensive security and fire alarm system for only the cost of the materials. Once it’s in place, he will provide complimentary monitoring service. Michael Jackson is senior architect for the Illinois Historic Preservation Agency. He has studied Soulsby Station extensively. He will also consult with project leaders to help ensure protection of the station’s historical integrity. 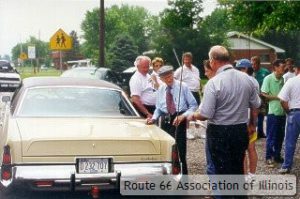 Members of the Route 66 Association of Illinois will provide consultation and in-kind labor. The Village of Mount Olive will provide assorted in-kind services and promote the station in community festivals. The Illinois State Historical Society will provide consultative help to establish the museum. The Wood River Refinery Museum (formerly called the Shell Museum) will provide similar help. It has already loaned some memorabilia for display. Regional tourism bureaus will continue to feature Soulsby Station prominently in their promotional materials. The core group of people who restored the station to National Register status will also lead this project. They include master craftsmen, practicing historians, museum professionals, an architect, and community volunteers. The Soulsby Society currently has $2,000 in the bank. Through the sale of T-shirts and fine prints of the station, we plan to have $4,000 by the time project work begins. Station owner Mike Dragovich will match that. As it did last year, Ace Hardware will donate paint. The remaining match will come from in-kind labor. 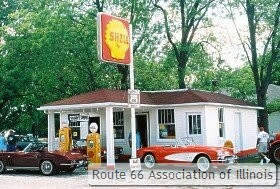 Soulsby Service Station in Mount Olive, Illinois, is one of Route 66’s original gas stations and is the oldest one still in usable condition. It stands in the center of two 50 by 80 foot lots at the southwest corner of 1st Street and Old Route 66 Street. Henry Soulsby built it from his own design in 1926, using commonly available materials. His son Russell helped. Later his daughters Ola and Wilma would join him as well. The original building was 30 feet wide by 12 feet deep. Its foundation was concrete and gravel block. There was no basement, only a crawl space. The siding was dutch lap yellow pine with a tongue and groove. The Ace Hardware laboratory in suburban Chicago conducted a computer analysis of the station’s paint in 2003. It indicates the primer was yellow and oil-based. To attract drivers’ attention, the initial cover coat was aluminum. It would be several years before the station took on a more neighborhood-friendly color. Initially, the station had no guttering or rainspouts. The roof pitched up from the edges of the building at a 20-degree angle to a flat area in the middle. For the first 11 years, it was covered with shingles. Centered in front of the station, a 22 by 12-foot canopy sheltered the pumps and service area. Its roof pitched back at an angle equal to the station’s. The area under the canopy was paved with concrete, while the approaches were paved with a variety of different and less durable materials over the years. In 1937, the Soulsbys built a 30 by 12 foot extension onto the back of the original building, doubling its size. They removed the original roofing shingles and covered the old and new portions of the roof with roll material instead. At the same time, they added guttering and rain spouts. For exterior siding, they used the same dutch lap pine. The Soulsbys then painted both the new and old portions light tan. Bands of yellow and red around the bottom of the station symbolized the Shell gasoline that they sold. The finished station’s most striking feature is that it had five doors. The east side, which faced Route 66, had three. When Henry and Russell expanded the station, they added single doors on both the north and south sides. No one ever had to turn a corner to get in or out of the station. This ease of access made the best use of limited space. It also proved convenient for Russell later when he ran a radio and TV repair business out of the north side of the station. The front of the station had three windows, alternating with the doors. The north and south sides each had one window on the east side of their doors. The rear or west side of the station had three windows. The station was never big enough to accommodate a repair bay. Instead, the Soulsbys performed oil changes and minor repairs on a steel ramp on the station’s south side. That ramp is still in place. About 25 years ago, however, when Russell was focused on his TV business, he let a pin oak seedling start growing between the ramp’s legs. The seedling is now 25 feet tall and its trunk is starting to lift up the ramp’s left leg. Inside the station, the Soulsbys used primarily wainscoting siding. The floors are bare pine. The middle third of the front of the station was partitioned and served as the office. 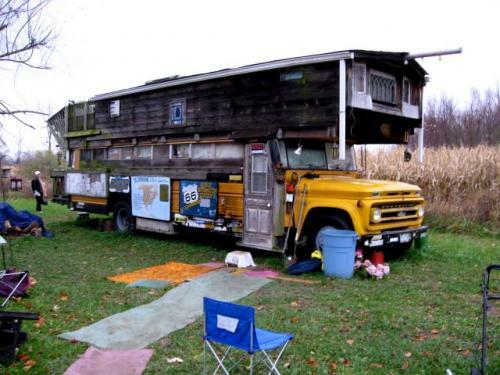 Barely big enough to hold a roll top desk and a wood stove, it had three interior doorways, plus a door to the outside. The stove would heat the station until the Soulsbys installed a natural gas furnace as part of their 1937 expansion. They had one water tap inside for car radiators, but never a washbasin or toilet. After his return from World War II, Russell began repairing radios and then televisions at the station. In the 1950s, he devoted the station’s northside room to this new business. He made no structural changes to the building, but did put an antenna on the roof to test his work. Family photos indicate the Soulsbys put vinyl siding on the station in the early to mid-1980s. When they did, they covered up two of the doors on the front side. Only the center one remained visible and accessible. Bypassed by the interstate, Russell stopped pumping gas in 1991 and had his storage tanks removed. The EPA has since certified the surrounding soil to be contamination free. In 1997, Russell sold the station at auction to Mike Dragovich, a neighbor. Mr. Dragovich used the station as his office. He braced up a section of floor that had sunk in, but made no other changes for nearly six years. 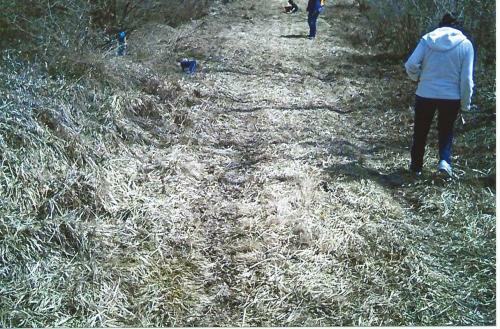 Then in April 2003 he began a major restoration effort with the help of some 20 volunteers. The crew first removed the station’s vinyl siding. Surprisingly, the dutch lap pine siding underneath was in excellent condition. Only 120 linear feet had to be replaced. For replacement siding, volunteers salvaged identical dutch lap from an old garage in nearby Staunton. In another surprise, the station still had four of its original doors and all of its windows. The crew was able to restore all of them. Only the aluminum storm door in front had to be replaced. To do this, the crew used a wooden door identical to the originals. Outside, volunteers removed all paint, leaving only bare siding. Ace Hardware donated new paint and primer. Consulting family photos and the Ace paint analysis, the crew chose a color scheme that the station had at least 45 years ago. From the outside, the station looks essentially the same as it did during its post-World War II heyday. On March 12, 2004, the Illinois Historic Sites Commission recommended Soulsby Station for listing on the National Register of Historic Places. We anticipate federal approval in June. The 1926 advent of Route ushered in a golden age for mom-and-pop entrepreneurs. Soulsby Service Station in Mount Olive is a living emblem of this time and its people. It is also the oldest usable gas station along the entire road. Mount Olive is in southwestern Illinois, where the tall grass prairie starts rolling into the Ozarks. The area’s rich coal deposits drew immigrants from England, Ireland, Italy and southeastern Europe in the late 1800s and early 1900s. Union organizers Mary “Mother” Jones and “General” Alexander Bradley are buried in a Mount Olive cemetery. John L. Lewis, who advocated the mechanization that made many small area mines unprofitable, is not always fondly remembered in the town’s cafes and bars. 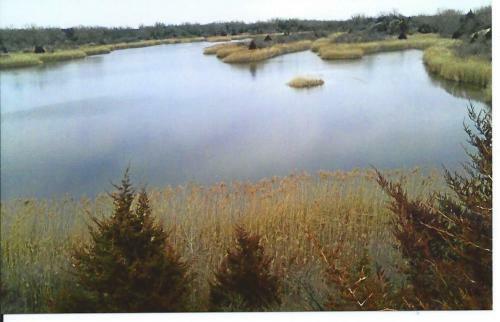 Henry Soulsby followed his father, an Irish immigrant, into this environment. But in the mid-1920s, an injury forced him aboveground. Betting that a national highway would soon pass through Mount Olive, he invested most of his life savings in two lots at the corner of 1st Street and what is now called Old 66. With the balance, he built a gas station. His son Russell, 16 and still in high school, helped. When he was about ready to open, Henry drove to nearby Benld to talk with Ben Fassero, another former miner. Fassero had started a gasoline delivery business in 1919. He bought gas by the tank car from the Wood River (later Shell) Refinery, hand pumped it into a storage tank, then pumped it back out for delivery. In the early years, he used a horse drawn wagon to make his rounds. Fassero readily agreed to be the new station’s supplier. This relationship between the Soulsby and Fassero families would last until the station stopped pumping gas in 1991. When Henry retired, Russell and Ola took over the station. Their partnership would endure until Ola’s death in 1996. Each proved as adept as the other at pumping gas, checking the oil and looking under the hood or chassis to detect and fix problems. At the close of business each day, Ola proved to be a homebody. But Russell had a restless, creative spirit that needed to roam. On evenings and weekends, he played clarinet and saxophone in a dance band, the Melodians. It was at a dance in nearby Litchfield that he met his future wife, Elizabeth. Together they had four sons. Russell encouraged them to attend college instead of join him in the business. They followed his advice. Russell always had an eye for technology. To recharge batteries and jump start cars, for example, he bolted a charger to the wall upside down. This made the cords just long enough to reach through the south window and serve cars outside. He was also the first person in Mount Olive to drive a car with balloon tires and a radio. During World War II, he was a communications technician in the Pacific theater. Shortly after coming home, he turned this experience into a second, simultaneous career—radio and TV repair. The station still has an antenna on the roof that he used to test his work. Route 66 was a great agent of progress and development. But its very success spelled its doom. In the late 1950s, Interstate 55 began supplanting it in Illinois. In Mount Olive, Russell ended up a mile away from the new thoroughfare. His TV business kept him afloat, but even this declined in the age of transistors. In 1991, by mutual agreement with the Fasseros, he stopped pumping gas. Even then, he stayed open to check oil, sell soda pop and greet the ever-growing legion of Route 66 tourists and documentarians. He sent everyone off with a wink and a wave. Finally, in 1993, he closed his doors for good. In 1997, he sold the station at auction to Mike Dragovich, a neighbor. Through a disagreement with his son who had power of attorney, Russell didn’t even have a key to the station during the last several months that he owned it. With the new owner’s encouragement, however, he started greeting visitors again occasionally. When he died in 1999, his funeral procession took him under the canopy one last time. This time it was his friends’ turn to wink and wave. The Soulsby Station Society and its collaborators will comply with the Secretary of the Interior’s Standards for Treatment of Historic Properties, Section 106 review requirements, the Davis-Bacon Act, and all appropriate local and state building codes. 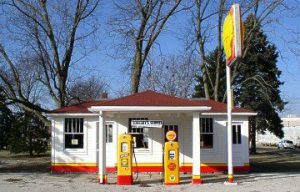 At its meeting this morning, the Illinois Historic Sites Commission unanimously recommended that Soulsby Service Station in Mount Olive be placed on the National Register of Historic Places. The state historic preservation officer must sign the recommendation and send it to the National Park Service, which must also approve. But our chances are excellent and we should get final approval in a couple of months. The Sousby Station’s restoration began last spring. We plan a few more minor repairs this spring. Next month we’re applying for a National Park Service grant to rewire the station and repair the floor, ceiling and roof. If you’d like to help, please get in touch. It may be small, but there’s always room at Soulsby’s. I thought I’d fill you in on how things went at the “Southern Six” meeting in Staunton last month. It looks like it’s going to be a good (and busy) preservation year on 66! More than 20 people attended the meeting. Two reporters and a photographer covered it. We began by making a wish list of all the preservation projects we’d like to get involved in. We came up with 14. Then we set a couple of projects as priorities and made (or accepted) assignments to check out all the rest. If this memo is your first notification of an assignment, please excuse me. But read on, too. First, we decided to finish the exterior Soulsby restoration and make a few improvements inside. We’ll put in new sign panels outside (Nelson Grman has found some free ones) and finish repairing the doors. Inside, we’ll do some floor and ceiling repairs. It should take about three workdays—probably in April and May. I will work with Soulsby owner Mike Dragovich to write a grant to the National Park Service. With this, I think we could make some infrastructure improvements at the station: the roof, the wiring, a security system, and some insulation in the ceiling. I’d also like to figure out a way to insulate the windows and doors. If we win the grant, we won’t get any cash until late this year. That means we probably won’t do any of the grant-related work until the spring of 2005. We’d have to match the amount of the grant, but could do it with in-kind labor. I have submitted an application to put Soulsby Station on the National Register of Historic Places. We have an excellent chance. We’ll get a preliminary answer March 12 and official notice a month or so afterwards. Our second priority project is a workday at the Sky View Drive In in Litchfield. They want to spruce it up a bit for a giant car show that a local car club is sponsoring there this year. Tonya Flannery agreed to put me and Carol Stuttle, the Sky View’s longtime manager, in touch with each other. When we set a work date, I’ll notify everybody. It will probably be in early May. Bill Shea, who attended the meeting with his wife Helen and son Bill, promised he will be making additions and improvements to his gas station museum. Since most of the work there is done by someone named Shea, Bill probably won’t ask for much outside help. However, we better all come by and visit. Nelson Grman said a Sears house a block south of Soulsby’s is in danger of being demolished. Property owners have built a nice new brick home just a few feet west of it. The owner is willing to sell the Sears house and let the new owner relocate it. Nelson has already used his considerable Mount Olive contacts to do some background work on this project. I’ll pitch in as I can. By our standards, this could be an expensive project. And someone—us, a private owner, or government—will have to manage the property. There may have been 100,000 Sears houses. But this one’s on Route 66 and it’s ours. Everyone would like to see the Art’s sign in Farmersville restored. Tonya Flannery agreed to talk with the owner. We could probably do it in a long weekend. We may even get the paint donated. Tonya also agreed to investigate what we could do to restore the Gas or Less sign near the Ariston in Litchfield. Rich Henry will help. In any preservation project, our first goal is to keep something where it is. But sometimes preserving an object means moving it. Rich offered his Rabbit Ranch in Staunton as a home for such objects. Another sign we’d like to restore is at the Bel Air Drive-In near Mitchell. Unlike the other two signs, this one would likely have to be moved. Several years ago, Rich Henry talked with the sign’s owners about acquiring it. They weren’t interested in making a reasonable deal. But Rich agreed to try them again. If we think a different voice is needed, I’ll speak up. The Luna Café sign in Mitchell is also in dire need of restoration. I agreed to ask Ron Warnick and Emily Priddy to check things out with the Luna’s owner. As with other sign projects, this one probably wouldn’t be that expensive—just laborious. And we may get free paint. As to road signs, Ollie Schwallenstecker agreed to make a list of alignments or stretches of 66 that aren’t clearly signed. This will involve working with the Department of Transportation and with local units of government. But at least it won’t involve much cash or physical labor. Thressia Usherwood said Bill Thomas is trying to redo the old Grill Restaurant in Atlanta. She agreed to put me and Bill together. I’ll inform you all of the results of that rendezvous. There might be an opportunity for a lot of group labor here. But first we have to learn more about what Mr. Thomas has in mind. Ollie said he thinks he may have located one of the round tourist cabins that DeCamp Junction used to have. It’s in Worden—not far away. He suggested that we investigate the possibility of moving that cabin back to DeCamp’s. This would likely require some investment by DeCamp’s, but it would be a wonderful “addition” to their site. And we’ve already proved we’re good with paint scrapers and brushes. Ollie promised to get more details. Ollie also said that the Coliseum in Benld has long been interested in building a Route 66 display. We should definitely keep this offer in mind. But we already have displays at the Dixie, Funk’s Grove and Soulsby’s. We’re also going to have something nice in Pontiac. I just don’t know how many displays we can stock and maintain. Anyway, Ollie will get more details for us on the Coliseum. It would have made a wonderful alternative home for our Route 66 Hall of Fame. Tom Flasch suggested we put up an interpretive sign at the curve near Wilton Rinkel’s in Hamel. Either he or I will talk with Randy Wierzgac, who’s done quite a bit of sign painting and restoring along the road. Rich Henry, Wilton’s son-in-law, is a natural to check out the history. He can also determine where we would be allowed to post such a sign. Where would people park? Ernie Edwards suggested that we look into landscaping a stretch of old, old 66 between two cemeteries near Lincoln. This is a picturesque piece of road that may someday qualify for the National Register of Historic Places. I suspect we’ll have to deal with a lot of governmental bodies and owners to get this project going. However, it shouldn’t be too costly. Ernie will start building some local interest in it. I’ll scout the property to gauge its National Register potential. Ernie also invited us all to a workday or two at his Pig Hip Museum in Broadwell. He recently got a grant from the National Park Service to install a furnace and make other improvements. The furnace is already in, but there will be more work in the spring. We should all try to find a way to help. However, the Pig Hip project began under the auspices of the Route 66 Association’s Preservation Committee. I don’t want to supplant their leadership. Ernie isn’t sure what that committee hopes to do this year. I don’t know, either. If any of you do, please holler. Then we can decide what the Southern Six needs to do. So there you have it—our hopes and dreams. I think they’re all achievable. In looking them over, I see that only one involves the possible ownership or management of real estate. And except for that Sears house, the projects don’t involve much money. At this time, I’m still undecided whether the Southern Six should incorporate as a separate organization. So long as we can keep getting things done, I’m not sure we need to. But if we apply for grants or other funding, we’ll have to. I’m asking everyone who has an assignment to keep people posted on their progress. I’m sure we’ll be hearing a lot from each other. We’ve scheduled another meeting of our Southern Six group for Sunday, January 11, at 1 p.m. at the Super 8 Motel in Staunton. We’ll be in the conference room. Please attend if you can—and tell your 66 friends about it. I’ll also be notifying the area media. The more people that we gather together, the more we can do. My goal for the meeting is to pick two or more projects (besides finishing Soulsby Station) that we can work on next year. These should be projects that the Route 66 Association of Illinois or the Preservation Committee have not indicated they will take on. We don’t want to duplicate what’s already planned. When representatives of the National Park Services visited Soulsby Station in September, I’m told they said it was just about the best preservation project they’ve seen on Route 66. Let’s give them more to talk about. We had a light turnout last Saturday, except for the rain. Nelson Grman, the only one of us who has made it to every session, was waiting for me when I arrived. Mike Dragovich came over and helped out. And Don Lee brought a beautifully restored station door back from his shop in Waggoner. When it finally stopped raining, we trimmed the caulk that we’d laid in last week. We’re hoping for better weather and a more productive Saturday this week. Last night, I rendezvoused with Dale Johnson of Ace Hardware and picked up the paint that they’ve donated. The priming will begin Saturday morning. Come on down! We also need two or more special volunteers to caulk the windows and another to plant some flowers under the repair ramp. As restoration jobs have a way of doing, this one has taken more time and effort than expected. But with help, we will get the job done. It’s certainly worth our while. Many of you have probably already heard this story from Ollie Schwallenstecker, but it’s been a busy day on the siding front. After several failed attempts to find the station’s original shiplap siding in stock, we looked for someone who could mill it for us. Early last week, Nelson Grman found a yard in Macoupin County that would mill it for about $4 a foot. Later, John Murphy got an estimate of about $2 a foot in Springfield. Acting on a tip from Mike Dragovich, I found a woodworker near Waggoner, Don Lee, who offered to mill the siding just for the price of the lumber. With that, we thought things were settled. Then Nelson came back and topped us all. He’s found a garage in Staunton that has more than 200 feet of the exact type of siding we need. It’s in pretty good shape and most of it is in pieces that are 20 feet long. Best of all, since its owner is about to tear down the garage, the siding is ours for the taking! On Saturday, the 19th, we’re going to finish the scraping and perhaps get on to repairing the siding that we’re going to leave in place. Don Lee has promised to take a look at the doors and windows and see if he can get started on their restoration. It was colder last Saturday than it had been on our first work day, but we got to work anyway. Ollie loaned me a pair of his coveralls (imagine that picture!) and we got about 95 percent of the vinyl siding torn off the building and pulled all the nails. The car siding underneath is in better shape than we expected. A carpenter friend of Nelson Grman took a look at the building on Monday and said we’d need only 120 feet of replacement siding. I’ve talked with a couple of lumber yards that say they still carry this kind of old fashioned car siding, as they call it. If it’s a match with ours, we can buy it for about 63 cents a foot. If we have to have millwork done, our siding’s going to cost us about six times that much. I’ll let you know more about that next week. This Saturday we hope to get all the scraping done and maybe some window and door repair. Come on down! We’ll have coffee and plenty of baked goods from Jubelt’s. And if we use a power washer, it won’t matter if it’s raining or not. So far, friends of Soulsby Station have been very generous in their support of our restoration effort. Nick Adam of the Ariston donated $100. So did someone at the 66 Association board meeting last Sunday (I don’t know who yet because I wasn’t able to attend). Hank Hallmark of California, James Soulsby of OKC and Warren Dorn of Elmhurst have donated $50 apiece. And Randy Smith from East Peoria has renewed his membership. Nick Adam at the Ariston has contributed $100 to keep us in donuts and coffee and other edibles while we’re working on the Soulsby Station. He sends his greetings and best wishes for success. I’ve attached a 40-year-old picture of the station that shows the general color scheme that we plan to use. Note the Shell red band around the base of the station and the narrower Shell yellow band above it. I have good news about our plans to restore Soulsby Station. Through Dale Johnson, Ace Hardware has agreed to furnish the paint. They’ve also done a computer analysis of paint chips we took from the station. And we’ve found a gentleman, Anton Fassero, who helped deliver gas to the station from the day it opened. We’re going to take a sample book to him soon and see if he can remember a match for us. He thinks he can. Ollie Schwallenstecker will lead the restoration work effort. He has scheduled the first workday for next Saturday, March 29, from 9 a.m. to 2 p.m. He hopes to get all of the siding removed and part of the scraping done. We’ll have another workday every Saturday, so long as it’s above 45 degrees and not raining in Mount Olive, until the job is done. Our goal is to have everything ready in time for this June’s Route 66 Motor Tour. To volunteer, the main thing you have to do is show up and work. But we’d also appreciate it if you’d contact Ollie or me by e-mail and let us know if you’re planning to come. If you can’t be there on March 29, let us know what other Saturdays you might be able to make it. We’ll be sure to work you into the schedule. If you live in or near Mount Olive, you can also contact Tom Spears, Mary Gajewski or Nelson Grman as they have agreed to recruit local volunteers. We’ll have some basic equipment at the station, such as stepladders and drop cloths. But if you have a paint scraper or other equipment you think we could use, please bring it. Be sure you put a band of colored tape on each piece for identification purposes. The advent of a national road system in 1926 ushered in a golden age for small-time entrepreneurs. 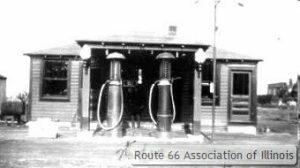 In Mount Olive, Illinois, it inspired miner Henry Soulsby to put down his pick and shovel and erect a gas station along what would soon become Route 66. His son Russell, 16, and daughters Ola and Velma helped build and operate the new business. It had a red-shingled roof and cream-colored redwood siding. From the beginning until the end—65 years—they sold only Shell gasoline provided by the Fassero Brothers distributing company in nearby Benld. Soulsby Shell is a one-of-a-kind design. At 13×20 feet, it was smaller than the restrooms in most modern stations. There was barely room for a coal stove, a cash register, a roll top desk, a battery charger and a few supplies. The Soulsbys added a 13 × 20 extension to the back of the building in the mid 1930s, but it was still never big enough to accommodate a car. For minor repairs, they had a drive-up ramp outside. For oil changes and grease jobs, they used a portable lubester. And to charge a battery, the Soulsbys would just pass the cables out the window. The canopy, an original fixture, hung almost too low for gravity flow pumps to fit. And although there was a water tap to refresh cars’ radiators, the station never had a sink or a restroom. For those conveniences, the Soulsbys always went to Henry and Ola’s house next door. Perhaps the station’s most striking feature is that it had five doors. The Soulsbys and their customers never had to turn a corner to get in or out of the station. They just used the right door. This ease of accessibility made the best use of limited space. It also proved convenient for Russell when he ran a second business out of the north side of the building. Other people think the station’s drive-up ramp is its most striking feature. But that’s more by accident than design. Russell stopped using it about 30 years ago. But when local teens insisted on using it at night to tune up their hotrods, he let a pin oak grow between the ramp’s legs. That oak is now 25 feet tall. It joins with several walnut trees on the lot to produce a nice shade. When Henry retired, Russell and Ola took over the station. Their partnership would endure until the station closed in 1991. Each was as adept as the other at pumping gas, checking the oil, and looking under the chassis to detect and fix problems. At the close of business each day, Ola proved to be a homebody. She would never marry. But Russell had a restless, creative spirit that needed to roam. On evenings and weekends, he played clarinet and saxophone in a dance band, the Melodians. It was at a dance in Litchfield that he met his wife, Elizabeth. Together they had three sons—Don, Ron and Ed—as well as another child who was stillborn on Christmas Eve, 1943. Russell always had an eye for new technology. He was the first person in Mount Olive, for example, to drive a car with balloon tires and a radio. During World War II, he was a communications technician in the Pacific theater. Shortly after the war, he turned this experience to a second career—radio and TV repair. The station still has an antenna on the roof that he used to test his work. 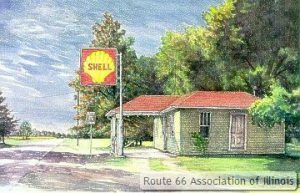 When Interstate 55 replaced Route 66 in Illinois starting in the mid 1970s, it spelled the end for most mom-and-pop gas stations. But Russell and Ola kept pumping what gas they could until 1991. Even after that Russell stayed open to check oil, sell soda pop and talk with the ever-increasing number of Route 66 tourists and documentary makers. Finally, in 1993, he closed for good. In 1997, he sold the station and Ola’s house at auction to a neighbor, Mike Dragovich. Parenthood and the pressures of business had forced Russell to give up his musical career soon after his return from the war. But he and his wife had a lifelong love affair with dancing. When Elizabeth died in 1970, Russell stayed home for a year. But he finally decided Elizabeth would want him to dance and he took a new dancing partner, a lady from Staunton. She never called on him; he always called on her. But together they enjoyed their twilight years on the dance floor. He explained once how they managed to win second place at a festival in Springfield. When Russell didn’t show up for an engagement one day in 1999 and didn’t answer the phone, his dancing partner finally called on him. It was too late. An accumulation of old age ailments had overtaken him. His son Ron thought he may have been reaching for the phone when death came. On the way to the cemetery, his funeral procession passed under the station’s canopy. There’s no way to prove it, but we think Russell may have waved good-by one last time. He could tell a story with his smile. The station’s new owner, Mike Dragovich, is a Mount Olive native. His father George is retired and a former mayor of the village. With degrees in aeronautics and electrical engineering, Mike ran a contracting business with his brother for many years. Currently, he works for the Illinois Environmental Protection Agency. Since buying the station, he has used a portion of it as his office. 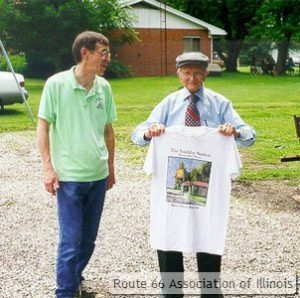 But he has also worked readily with two not-for-profit groups, the Soulsby Station Society and the Route 66 Association of Illinois, to honor the site’s history and its tourism potential. No work needs to be done on the station’s storage tanks. Russell had them removed about 10 years ago. The soil underneath and to the sides of the tanks was certified contaminant-free by the Illinois Environmental Protection Agency in 1997. There are also no groundwater issues. Ollie Schwallenstecker will coordinate the repair work. This will include testing the original wood siding in several spots before all the vinyl siding is removed. Tom Spears and Mary Gajewski will recruit local craftsmen to perform the work on a volunteer basis. Emily Priddy will manage publicity. 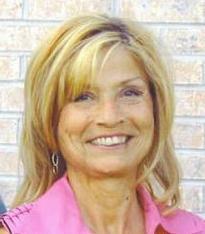 She and Ron Warnick, along with Nelson Grman, will help recruit other volunteers. They will also work with Tom Spears to locate replacement windows and doors (if needed). Mike Dragovich, Mary Gajewski and Tom Spears will try to locate old photographs of the station and the Soulsbys. Gene Peters will coordinate fundraising efforts. Tom Teague will maintain contact with the Illinois Historic Preservation Agency to ensure that the planned work will be sufficient to meet national Register standards. He will also serve as the project’s treasurer. 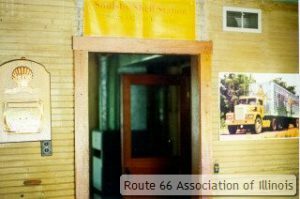 The Soulsby Society and the Route 66 Association will hold periodic open houses and tours of the station. However, we anticipate it will operate primarily as a drive-up, non-staffed museum. Accordingly, we’ll design all interior displays so they can be easily seen through a window. In return for any enhancements to the value or condition of his property, Mike Dragovich has agreed in principal to a nominal long-term lease to the not-for-profit group that manages the museum. We lost one of the road’s originals today: Russell Soulsby. Russell and his father built their Shell Station in 1926. He pumped gas there until 1991, closed it 1993, hung around for a few years, then sold it in 1997. I wasn’t quite sure how old he was. When I met him, he told he was 16 when the station opened. But he seemed to age rather slowly in his later years. This makes me think he may have been younger than 16 when he quit school for the station. I spoke with Russell’s son Ed and he said his dad was 89 and he had driven his car as recently as this morning. Russell’s wake and funeral will be held Friday, November 5, 1999 at the Becker Funeral Home in Mount Olive and he will be buried in Elmwood Cemetery, Litchfield next to his wife. Those of you who have e mail have already received this news. For the rest, it is my sad duty to tell you that our Society’s namesake, Russell Soulsby, died on October 30. He was 89. His funeral was November 5. Russell was a true Route 66 original and a defining voice of the Route 66 revival. He and his father built their station just as Route 66 passed through Mount Olive in 1926. At only 13 × 20 feet, it was smaller than the restroom in many modern stations. They added another 13 × 20 feet section in the ’30s, but the station was still miniscule by modern standards. Car repairs had to be performed on a drive up grease ramp outside. After serving as a radio communications instructor in World War II, Russell came home and took over operation of the station. His sister Ola joined him as a fulltime partner. And just as television was becoming popular, he added a TV repair service to his business. This helped get him through the thin days caused by the encroaching interstate system. Russell pumped gas at the station until 1991. For the next two years, he sold sundries and checked oil. When Ola entered a nursing home in 1993, Russell didn’t have time to take care of her and the station, too, so he signed power of attorney for the station over to his sons. They tried to sell the property to the state preservation agency, then the Village of Mount Olive, then the Route 66 Association, then the Soulsby Station Society. When none of these plans worked, they finally sold it at auction in 1998. The new owner is neighbor Mike Dragovich, another son of a miner. He has worked quite well with the Soulsby Society as well as the 66 Association to make the station as traveler friendly as possible. Family members at first thought Russell died of an aneurysm. It now appears that death came from a combination of ailments brought on by old age. He is survived by sons Ed and Ron, plus his longtime companion and dancing partner, Olivia Dobrinich. After the service on November 5, Society/Association members gathered at the station. They included Jeff LaFollette, Randy Smith, Marie Jibben, Shellee and Trevor Graham, and fellow Hall of Famers Wilton Rinkel and Ernie Edwards. When the procession came by, they saluted it as each car passed directly under the station’s canopy between the support columns and the front door. Under the direction of Collins Miller and former U.S. 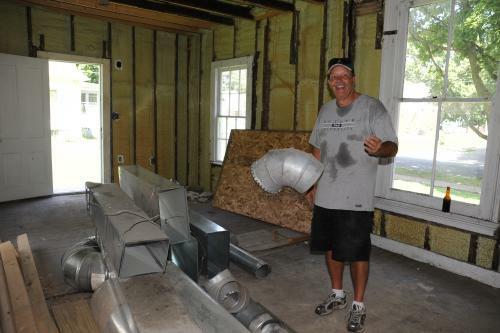 Congressman Tom Ewing, work on the historic Strevell house has reached a new stage. The Strevell house, located on Livingston Street in Pontiac, Illinois, is the last remaining structure in Livingston County known to have welcomed Abraham Lincoln. 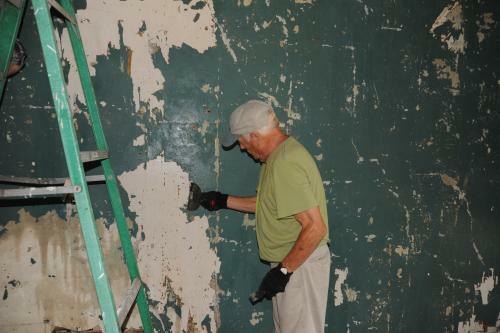 The ongoing project to restore this historic structure is under the aegis of the Livingston County Historical Society. The house was built in 1854 in the Carpenter Gothic Style. Jason W. Strevell was born in New York of Dutch stock, was admitted to the bar in 1855, and “came west” to Illinois that year. In 1856, Strevell opened a law practice in Pontiac, which brought him into contact with another young lawyer named Abraham Lincoln. Strevell was elected to the city’s board of trustees when Pontiac was incorporated as a village Feb. 12, 1856, and was part of the state’s Republican convention that gave Lincoln the presidential nomination in 1860. Strevell later served two terms in the lower house of the Illinois legislature, and one term in the upper house. In January of 1860, a few months before Lincoln was nominated for the nation’s top political office, Lincoln came to Pontiac to give a speech before the Pontiac Young Men’s Literary Society. The speech, given at the Presbyterian Church in Pontiac, was only moderately successful as Lincoln avoided talking about the major political issues of the day, and instead spoke on the history of man’s inventiveness. According to contemporary newspaper accounts, his listeners were disappointed that Lincoln did not address at all the issue of slavery – a topic loaded with political minefields in the years and months prior to the start of the American Civil War. Local history sources state that after his speech Lincoln retired to Strevell’s home for a small reception and to wait for the early morning, southbound Chicago & Alton train. After the guests had left, Strevell and Lincoln discussed the future, for the nation and each man personally. Months later, after Lincoln won the election, and sworn in as President, he invited Strevell and his wife to visit him in the White House. The couple, unfortunately, was unable to make the trip to Washington. In 1879, Strevell left Pontiac and resettled in Miles City, Montana, where he again became an important personage in local politics and law. In 2008, when the Strevell home was threatened with demolition, a group of concerned citizens banded together to purchase the home, which was then acquired by the Livingston County Histosrical Society, who now oversees the restoration. The Strevell house project is entirely funded by private donations, and through the sale of memorial bricks which make up the front walkway to the house. According to Tom Ewing, “the project as raised a little over $78,000 to this point, and we have spent most of that repairing foundations, adding a new roof, and the complete restoration of the exterior. We are now beginning the process of rehabilitation on the interior.” According to the Historical Society’s plan, entry hall and front parlor, will be restored to represent how the rooms might have looked in the late 1850s when Lincoln visited for the last time. An adjoining room will be used for local history displays and small community-oriented history events. The Historical Society welcomes the support of anyone interested in our local history. Donations to the Strevell house project may be made directly to the Historical Society or through the purchase of memorial bricks. For more information about the Strevell house and the restoration project, contact Pontiac Tourism at (815) 844-5847. The towns of Braceville and Godley border one of the best areas for fossil hunting in the state. Collectors come from all around the country. This area is famous because it was here that the Tully Monster fossil was discovered. This long extinct creature is named for the man who found it in 1957, Francis Tully. The Tully Monster is also considered to be the official State of Illinois Fossil. The best place to easily find common fossils is away from the popular fish and wildlife area. Some places here are so abundant with fossils that no digging is even required. 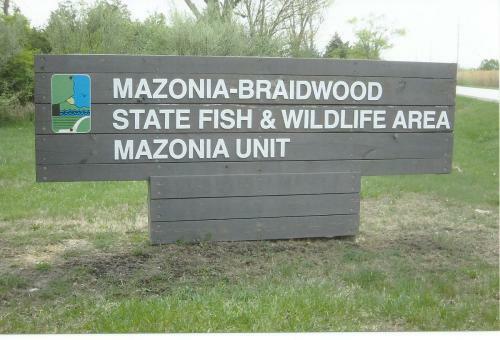 Maps for the entire area are readily available at the visitor center of the Mazonia State Fish & Wildlife Area just off of Route 66. There are help-yourself boxes with trail maps in front of the facility. The trail we took was 6 miles long through some beautiful areas that went completely around Lake Ponderosa. At about the half way point around the lake the loose stones are in great abundance. Jellyfish and Shrimp fossils are laying everywhere. To easily find this area leave Route 66 at Godley by the Mining Museum. Travel through town on Kankakee St. to 5000 N Rd., and turn left. Travel about one mile on this rough gravel road to the second pull-in parking area on the right side. Then travel farther in to the interior parking area. Don’t worry, the walking trail is rough but you won’t get lost. Our group was of all ages and none of us had any concerns and we made it just fine. Remember that the trails are not paved, and there are no washrooms and no water, so plan accordingly. Bring a shoulder strap style bag to carry your rocks in. Be aware that big stones tend to get heavy on a long walk. The reason this area is so abundant with fossils is because of all the strip mining that occurred here in the 1800’s and early 1900’s. This area millions of years ago was under water. Throughout the years this area dried out. However, rich veins of coal were in abundance near the surface of the land. So during the 1800s strip mining methods were used to extract the coal. In strip mining, the top layers of soil are removed to expose the veins of coal. This scraped-off top soil is now referred to as slag heaps. Many places now are hilly areas of slag surrounding lakes created where the coal was removed. Laws in the early days did not require the slag to be put back into the holes created from the coal removal. As a result the bottom of ancient oceans are readily available to all who are adventuresome enough to seek out this unique nature site. Fossil hunting is allowed here from March 1st to September 30th. Route 66 Treasures Arrive at New Home! It’s finally here – the long awaited arrival of two exciting acquisitions to our Route 66 Association of Illinois Museum and Hall of Fame in Pontiac, IL! 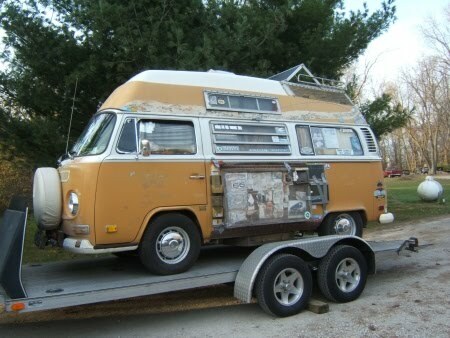 This coming Sunday, September 26, 2010 is the day when Route 66 icon and artist, Bob Waldmire’s, VW van and converted schoolbus will arive at our museum for eventual display! According to Association Treasurer, Marty Blitstein, who was instrumental in making these acquisitions come to fruition, it will be a couple more weeks before the van and bus will be available for viewing at the museum. First, the items need to be prepared for display. …Been looking forward to the day that Bob’s vintage school bus, VW Van, and all of the many treasures within will finally be archived and on display for all 66 Roadies to enjoy and appreciate! Glad to know that the Pontiac Hall of Fame and Museum has taken ths first steps in doing just that. Thank you for making all of this become a true milestone event in Mother Road history. Well done! I tip my bandana to Illinois Route 66!… where the road begins. Although the Waldmire van and bus will not immediately be on public display, you can be certain that we will keep you informed as to when you can visit these iconic Route 66 items for yourself here on this site, on our Association Facebook page and on Twitter. On July 3, 2010, the Preservation committee held a very special picinc at the Standard Oil Station in Odell, IL in honor of a very special lady, Lenore Weiss. Lenore was a dear friend of Route 66 in general, our Association in particular and of many of our members. She passed away earlier this year and in her honor, the Preservation committee decided that a memorial to her dedication to Route 66 was in order. After a tasty picnic lunch consisting of burgers, hot dogs and an assortment of side dishes and desserts contributed by the attendees, a brief ceremony was held. In Lenore’s honor, a pear tree was planted on the property of this, our Association’s flagship preservation project, the Odell Standard Oil Station. Lenore rolled up her sleeves along with the other preservationists to bring this treasure of the Mother Road back to its former glory. That’s why this particular location for the picnic and dedication was so fitting to her memory. 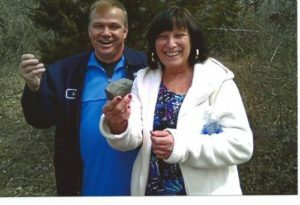 There were fond memories recounted and tears shed as her husband John and several friends spoke about Lenore, thanking the committee for their dedication which in itself honors her memory. Route 66 is all about the people and the relationships forged along the Mother Road. This day was a fitting tribute to the comaraderie felt by those who are the her guardians, preservationists and historians. Thank you, Lenore, for bringing us all together in this worthy cause.